Last November, I reviewed a heart-wrenching contemporary YA novel titled Breakable by Aimee L. Salter. The book focuses on the very real and all-too prevalent issue of bullying and the life-long effect it can have on people whose victimization begins in childhood or teen years. This wonderful novel has been re-released (with some changes) as Every Ugly Word, published by Alloy Entertainment. It’s available today from Amazon.com! Every Ugly Word follows seventeen-year-old Ashley, who has been bullied for years by a clique of fellow students who used to be her friends. The daily torment escalates when Ashley’s one remaining friend, a handsome and popular boy named Matt, begins to date one of the worst of the bullies, a nasty scheming girl named Karyn. Karyn is able to hide her true personality from Matt, who is blinded by her pretty face and popularity. Things were difficult enough for Ashley when Matt saw her just as a friend, but when he starts going out with Karyn, it’s more than Ashley can take. Karyn and the rest of the crew are all too aware of Ashley’s feelings and use this as additional ammunition against her. There is one other person in Ashley’s corner. For years, she has been communicating with her future self, "Older Me," whom she can see in mirrors. Ashley wants "Older Me" to guide her through the impending crisis, but as the bullying spirals out of control, she is less sure her older self is able to help. Meanwhile, the voice we see of the older Ashley is growing more desperate and more determined that the course of younger Ashley’s fate must be different from her own, but how? 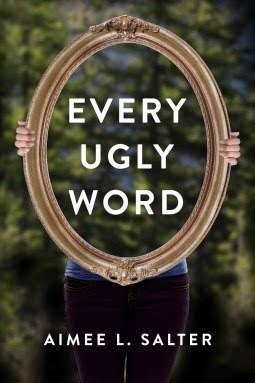 Every Ugly Word is a fast-paced read with memorable characters. Salter is able to get inside Ashley’s head to show both the emotional frailty and the resilience of a teenager who has been victimized for years but who retains the capacity for a strong and generous love. It’s a heart-wrenching tale of a girl in crisis and a powerful book about the long-lasting effects of bullying. The re-released version is even more readable than the original and I was just as engrossed the second time around. To learn more, check out Aimee’s website at: Aimee L. Salter- author. radiation days. the rollicking, lighthearted story of a man and his cancer by Lynn Hoffman is a lovely book that demonstrates the art and the value of living in the moment. The author is a novelist/poet, a chef, a professor of culinary arts, and a wine and beer connoisseur. A couple years ago (how long now?) he became a blogger–journaling his way through his year-long experience as a man with cancer. As someone whose life revolves around the appreciation of food and wine (and beer), it was particularly cruel of Fate to strike Hoffman with cancer of the throat. He underwent chemotherapy and radiation that, for a long time, destroyed his sense of taste. He had a hard time swallowing and talking (particularly problematic for a teacher.) In the book, which builds on Hoffman’s blog posts, he explores how losing something so fundamental affected not just his life but potentially his identity. He has good days and bad days and some truly terrifying days, but each vignette shows how he retained a wonder and a curiosity about something that seemed to propel him onward to what will come next. Hoffman’s voice animates the book with a sincere warmth and gratitude (interspersed with occasional bits of frustration tempered with humor) that make the reader understand why the friends he is so appreciative of are so devoted to him. This is a cancer memoir, but there’s more to it than that. Despite the all-absorbing job it is to be a cancer patient, Hoffman manages to go on living his life. He pays attention to the little things and shows us that they are, in fact, the big things. He points out the problem with "the bucket list." You shouldn’t wait until you’re dying to make a list of things you want to do. Get out and do them. He reminds us of the importance of friends, kindness, generosity. Of course we all know this, but he puts it all in a context that lets the message sink in a little more. Oh, also, get your kids an HPV vaccine. 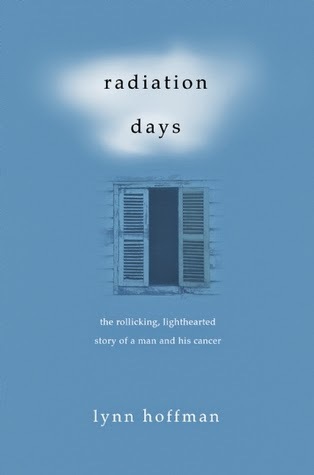 radiation days is not just a book that I would recommend to someone who is facing a cancer diagnosis or to a family member of someone in that position. It’s a life philosophy book. We shouldn’t have to have a cancer diagnosis to appreciate life, but we’re generally so busy rushing through it that we don’t stop to look for the good in what we are experiencing right now. In the book, Hoffman mentions how much he loves teaching, one of his professions, and it was clearly helpful in his healing process that he was able to get out and teach classes as he was recuperating. Well, he’s teaching still. This is not a hit-you-over-the-head-with-its-sermon kind of book. It’s more gentle than that. Hoffman shows by example how each day is precious, cancer or not. It shouldn’t be so hard for me to remember that! Phew! 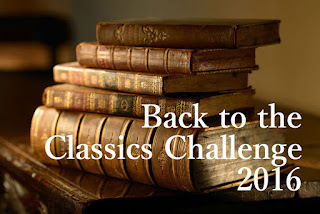 I’ve finished another of my Back-to-the-Classics challenge books, hosted by Books and Chocolate. This was my "Classic about War" choice: The Heart of the Matter by Graham Greene. 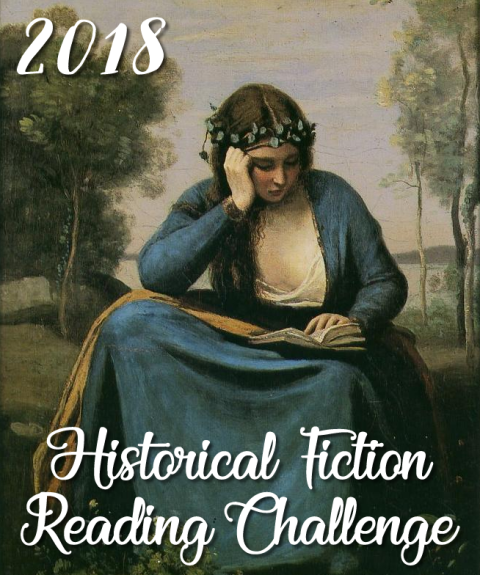 When I was making my selections, I looked into this book and read that it was set during World War II in a British colony on the coast of West Africa. The fact that it is wartime influences the plot of the book, but I thought the war would play a bigger role than it does. (How can a WWII book have so little to do with the war?) I chose it for the unusual setting and because I’ve never read Greene. It was a difficult but ultimately rewarding book. The sad hero of the story is Henry Scobie, an assistant police commissioner in a West African coastal town. While the heat, humidity, and colonial social structure are vividly described, I never quite got the sense of where this was actually taking place. (Although it is apparently supposed to be Sierra Leone.) Scobie is scrupulously honest and does his job with a plodding efficiency. He has been assistant commissioner for fifteen years and everyone considers him to be a good man. The commissioner trusts him. However, this counts for nothing since, as the book opens, the commissioner is retiring and someone else is being named to replace him. Scobie is at a weary stage in his life and doesn’t take the news too badly. But he is upset for his wife. Louise is lonely, depressed, and bored. She came to this town to be with her husband but never intended to be stuck there for so many years. She doesn’t fit in socially. And, she and Scobie have grown apart. Also, they had a daughter who died. So she’s miserable, and learning that her husband was passed over for promotion—humiliated—will be the last straw. Other things are going on, too. A new man has come to town, Wilson. Although he’s supposed to be an accountant, he is actually a government spy. Wilson takes a liking to Louise and, therefore, a disliking to Scobie. And there are two Syrians, cousins, who are rivals and who try to play the British to their own advantage. One of them, Yusef, attaches himself to Scobie. Scobie’s main difficulty is that he feels responsible for keeping Louise happy (an impossible task) as much as for keeping the peace in the town. He doesn’t love her anymore. He pities her. She is so upset by his lack of advancement that she can no longer bear to stay there. In order to help her leave, he needs money to book her passage on a ship. The bank won’t lend him a sufficient sum, so he is forced to borrow it from Yusef. Accepting money from one of the Syrians is not a wise move. Even though it’s a loan with interest, it puts him under obligation and it makes him look suspicious. His wife sails away. While she’s gone, a lifeboat carrying a few survivors from a shipwrecked boat (casualties from the war) arrive. (There is evidence throughout the book that there is a war going on. They have black-outs at night. They are aware of the far-off fighting. They worry about ships arriving safely at their destinations. They have censors checking their mail and telegrams. And one of Scobie’s jobs is searching ships for diamonds and other contraband or coded messages that might be important to the Germans. But the war still seems very far away and peripheral to the story.) Anyway, the lifeboat arrives, and with it, Helen Rolt. Helen was a nineteen-year-old newlywed who set out on the ship with her husband. Now she is a nineteen-year-old widow. Scobie takes to visiting her, as do some of the other villagers. But it’s Scobie who makes her feel safe. And then, they begin an affair. This can’t end well. The man who has been so straight and honest all his life is slipping. Although he thinks he loves Helen, he begins finding similarities between Helen and Louise and before long, he pities her and finds himself trapped by her as well. Then Louise returns, and things go downhill even faster. Scobie is not built for deceit. Woven throughout is Scobie’s struggle with Catholicism. It both sustains him and oppresses him. The book was difficult to read partly because of the writing style. 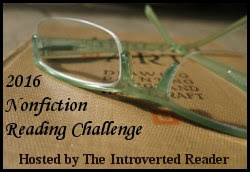 The omniscient narrator made me feel too distant from the characters. They were all sort of disembodied. It was so distant that I was uninterested. It was one of those books that I could stop reading mid-paragraph to go do something else. It was also difficult because there was a lot of aimlessness in the book. I got the sense that these people were leading very dull lives. (Even with war, spying, adultery. . .their lives were pretty dull.) That may have been the point. Scobie would have much preferred being left alone to having found Helen Rolt. Falling in love, or finding a replacement woman to pity, gave him a brief period of happiness but it didn’t last. 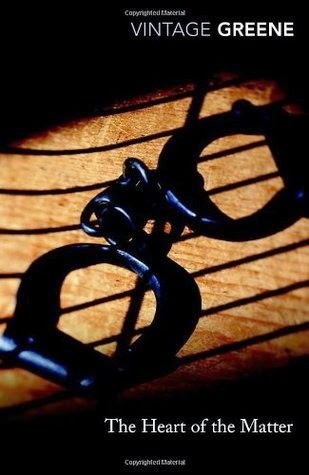 Still, it was Scobie’s downfall, his spiraling out of control, that made the book interesting. His struggle to reconcile things that could not be reconciled is what make this book tragic and oddly beautiful. Since this book has been on my shelf forever, I’m also adding it to my TBR pile challenge hosted by Bookish. So it seems I have a bit of an addiction. After reading Pere Goriot, I went to choose my next book. We were heading out on vacation, so I had some plane and car time to fill. 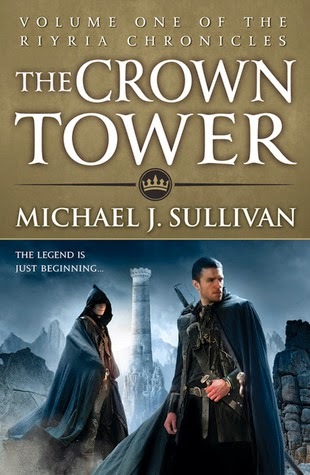 I packed my next Back to the Classics challenge book, but for the plane ride, I took along The Crown Tower by Michael J. Sullivan. I recently finished the Riyria Revelations trilogy and found that I wasn’t ready to emerge from that fantasy world just yet, even though the story was over. Sullivan must have gotten a lot of positive feedback from fans, because he continued with the story, but backtracked. He wrote a prequel—The Riyria Chronicles. There are two volumes to this part of the story. Book 1 is The Crown Tower and Book 2 is The Rose and the Thorn. The Crown Tower tells the story of how the two protagonists, Hadrian and Royce, are first thrown together. Arcadius, a professor of lore (magic) at the university, has enough sway over them both to compel them to complete a task for him—an impossible task. They have to steal a book for him that is kept locked in an impregnable fortress, the Crown Tower. Hadrian and Royce are strangers, but it doesn’t take long for them to realize how much they dislike and distrust one another. But they can’t succeed unless they work together. It’s a blast watching how they do. Having read the first trilogy, I know how the story will end. The characters are familiar ones. I know the outcome of their mission because the outline of the plot was given as backstory in the Revelations trilogy. But that doesn’t detract from my enjoyment of the book. It was fun to spend more time with these guys and have the details of their past fleshed out. I have The Rose and the Thorn left, but I’m holding off and reading something else first. 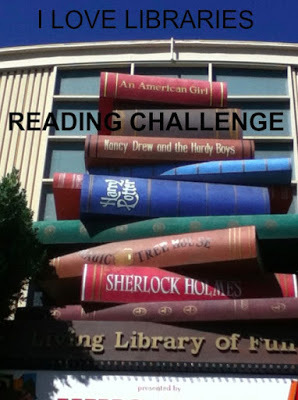 It’s the last of the books and I don’t want them to end! Like Lost Illusions, Pere Goriot is a story of the corruption of Parisian society, as well as an illustration of the various evils of human nature. The main protagonist is Eugene de Rastignac, but equally important are the title character, old Goriot, and a mysterious man named Vautrin. Rastignac has come to Paris from the south of France to study law in the hopes of improving his family’s situation. He takes a room at a cheap boarding house where he meets, among others, Goriot and Vautrin. Rastignac soon discovers that studying law is not the path to success in Paris, at least not the kind of success he desires. Fortunately, he has a distant cousin, Madame la Vicomtesse de Beauseant, who moves in the highest circles, who is willing to introduce him to society. Unfortunately, moving in those circles himself will require money and popularity with the ladies. Convinced that social status is the only thing that matters, he bleeds his mother and sisters of their savings in order to buy himself more fashionable clothes and to have a little spending money in his pocket. He also sets out to find himself a mistress. His eye first lights on a baroness who happens to be Goriot’s daughter. Inadvertently, he offends her by mentioning that he knows Goriot. He learns later that Goriot was once a fabulously successful grain merchant. Upon the death of his wife, he poured all his attention, affection, and wealth upon his two daughters. He saw them married well (or so he thought). He continued to shower them with gifts. But very quickly, they shoved him aside, seeing him only when they wanted money. Goriot is now one of the most impoverished of the boarders living with Rastignac. 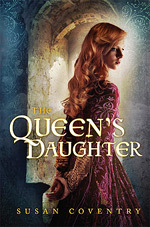 Still, his daughters are his world, and he continues to sell his possessions to help them. Rastignac next meets the second daughter and falls in love with her. She is in the process of being abandoned by her lover, so it’s a good time for him to swoop in and pick up the pieces. Before long, the gossips of Paris have acknowledged them as a couple. The daughter pries more money from her father to set up a little garret for Rastignac so that he won’t have to live at the boarding house any longer. Goriot is thrilled, believing that he will be allowed a little room in the garret’s attic so he can be near his daughter. Rastignac hesitates to take advantage of Goriot, but he does. He is appalled by the way the daughters treat their father, but he plays along, only softening the blow by occasionally lying and pretending the girls have been saying kind words about their father. In the meantime, Vautrin, another boarder, has been insisting that Rastignac will never have enough money to succeed at the rate he is going. When he coldly plots it out for him, it’s pretty clear that Rastignac is in over his head. Vautrin has a plan to help, but it involves something Rastignac wants no part of. And yet, as his mistress slips deeper into debt, his own debts mount, and Goriot’s last reserves shrink to nothing, Rastignac begins to take steps toward giving in to Vautrin. Pere Goriot is considered one of Balzac’s greatest novels. Rastignac’s transformation, his internal wrestling as his ambition erodes his morals, makes for some interesting but painful reading. 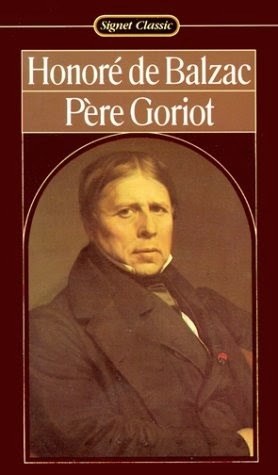 Goriot’s devotion to his daughters, his selflessness, his willingness—even eagerness—to reduce his own circumstances to abject poverty so that they can live the lifestyles that are only digging themselves deeper into trouble is some sort of lesson, but I’m not sure what. (Women do not come off very well in this novel. But the men are not much better.) There are some extraordinarily insightful commentaries on society and some wonderful descriptions of people and settings that show just what a brilliant writer Balzac was. Overall I preferred Lost Illusions, which tackled some of the same themes but covered more ground. The plot was more complex so it seemed grander. But both books are well worth the read.